Volunteers are usually the unseen heroes, but for one Team Redstone family, the community made sure their contributions were known. 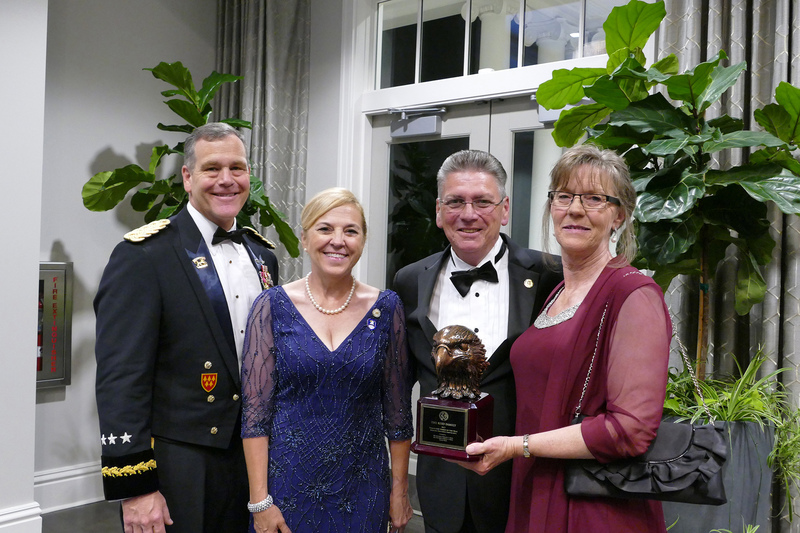 The Redstone-Huntsville Chapter, Association of the U.S. Army, honored Phillis and Robert Reid as their AUSA Chapter Army Volunteer Family of the Year for 2017 at the Redstone-Huntsville Army Birthday Dinner. The AUSA Volunteer Family of the Year Award recognizes an exceptional Army family whose dedicated volunteer service significantly contributes to improving the well-being of Army families and the local community. Nominees are submitted by AUSA chapters. The Reids volunteer for several charitable events in the community supporting veterans, surviving family members and other community activities. Robert and Phillis are both currently Department of the Army civilians. USASMDC/ARSTRAT hosted events honoring Survivor Outreach Services, or SOS, family members. She is responsible for the planning, coordination and execution of two events per year consisting of more than 65 surviving family members and more than 70 volunteers. Phillis is a committee member of the annual Black Tie Charity Ball that raises money for the Tut Fann State Veterans Home as well as organizing the annual Toys for Tots program at SMDC. Robert supports various fundraising activities including an annual pancake breakfast fundraisers and a 5K fun run. They both volunteer each year for the flag line at the Cotton Row Run on Memorial Day supporting the Redstone Arsenal SOS and community awareness of fallen heroes and the Legacy 4 Korean War Veterans. After the run, they also lay 44a wreath honoring military veterans at a local cemetery. Robert and Phillis also support the annual Semper Fi Community Task Force Heroes week, the Army Historical Foundation and the Huntsville Botanical Gardens. They both support other charitable organizations such as the League for Animal Welfare.